Two burly male friends came over yesterday to move the behemoth bookcase upstairs. Today, I installed the shiplapped and beaded back and moved it into its final position. Next, I'll build the crown molding and once that's added to the top, I can cross this one off my proj ect list. 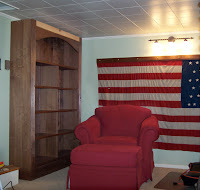 Incidentally, that flag hanging on the wall belonged to my great grandparents, immigrants from Sweden. It's a pre-1912 flag with 45 stars and I'm sure it meant a great deal to them.